Responding to new oil and gas industry opportunities, Foss Maritime Company is building the first three tugs in an innovative Arctic Class of tugs, a fleet expansion that broadens its capacity to take on large projects in extreme environments. Construction on the first tug starts in early 2013 at the Foss’ Rainier, Oregon shipyard, which will be expanded by an additional 10,000 square feet, and will require additional staff, in part to accommodate this project. The delivery date for the first hull is December of 2014, with the second to follow in December of 2015, and the third, a year later in December of 2016. Glosten Associates is Foss’ naval architecture partner on the project. 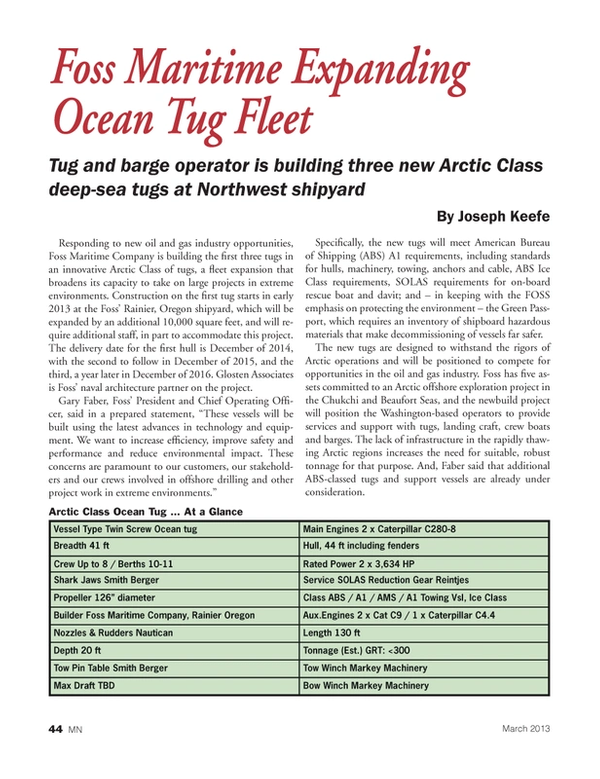 Specifically, the new tugs will meet American Bureau of Shipping (ABS) A1 requirements, including standards for hulls, machinery, towing, anchors and cable, ABS Ice Class requirements, SOLAS requirements for on-board rescue boat and davit; and – in keeping with the FOSS emphasis on protecting the environment – the Green Passport, which requires an inventory of shipboard hazardous materials that make decommissioning of vessels far safer. The new tugs are designed to withstand the rigors of Arctic operations and will be positioned to compete for opportunities in the oil and gas industry. Foss has five assets committed to an Arctic offshore exploration project in the Chukchi and Beaufort Seas, and the newbuild project will position the Washington-based operators to provide services and support with tugs, landing craft, crew boats and barges. The lack of infrastructure in the rapidly thawing Arctic regions increases the need for suitable, robust tonnage for that purpose. And, Faber said that additional ABS-classed tugs and support vessels are already under consideration. The three new tugs will be designed to achieve in excess of 100 metric tons of bollard pull and will be used primarily to tow barges with oil field modules, rig topsides and project cargoes throughout the world. Machinery will include Caterpillar C280-8 main engines, which comply with the highest federal environmental standards, and Reintjes reduction gears. Markey Machinery will supply the tow winch. Other environmentally focused designs and structural and technological upgrades include the elimination of ballast tanks, holding tanks for black and gray water to permit operations in no-discharge zones (such as parts of Alaska and California), hydraulic oil systems compatible with biodegradable oil, Energy efficient LED lighting; and High-energy absorption Schuyler fendering. Already with one of the largest fleets of tugs and barges on the American West Coast, Foss operates two shipyards and offers worldwide marine transportation emphasizing safety, environmental responsibility, and high-quality service. In this case, the primary impetus for building the boats was simple. Tirpak explained, “Foss is building these new tugs in response to new oil and gas industry opportunities. We are well known for our ability to safely operate in extreme environments. This investment in our fleet will broaden our capacity to take on new projects in the Arctic.” And, as the entire maritime industry and its energy cousins look north to new opportunities, the boats arguably arrive, just in the nick of time.